Defined by its eclecticism and opposition to simple definitions, fashion in 2016 is hard to pin down. With everything from sportswear to 90s goth present, this season’s runways looked like a collage made up of everything from Vogue’s archives. With all designers drawing from different (and often opposing) inspirations, it seems we’ve transcended trends in favour of variety and personalization. 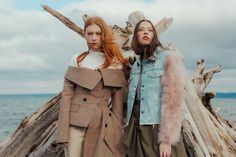 While this decentralization of the fashion industry leaves many floundering when considering their wardrobe for the upcoming season, it shows promise in its plethora of options. Options like those provided by textile and clothing designer Michons Marigot and her eponymous label. Since her first line, released in 2013 as a graduate collection, Marigot has been employing a varied mix of patterns, colours, silhouettes, time periods, and inspirations in her contemporary clothing. 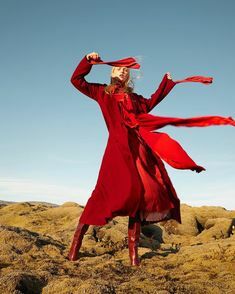 In an era when fashion seems to be drawing from everything to tell multiple stories simultaneously, Michons Marigot strives to provide the tools to piece together a story that is uniquely yours. Embracing and creating a future where off-trend is on-trend, Michons Marigot was made for 21st century fashion. The Decoration collection was shot by Katrina Cervoni for MICHONS MARIGOT. Rachel Stanga is wearing the Minimalist Coat over the Cheerleader Crop Top. All styling and art direction by Michons Marigot and makeup by Christine Jaramsingh. You seem to take clothing seriously, with your collections exploring the relationship between way of dress and sense of self. Do you remember when this curiosity took root? I believe that dress can be an expression of oneself, but I believe, or rather find it more interesting if it is an invention of a new self. Dress and clothing design, for me anyway, is always the opportunity to create a character and point of interest and to explore that until a body of work that reflects that is created. Dress and fashion have always been of interest to me, but I would say that what interests me is the world and the things I discover through art, music, culture, etc. I use fashion design because that is my means of visiting, addressing or paying homage to something I find dear or compelling. On your website you credit “narrative, passion, and a unique perspective” for your creative design sensibilities. Can you explain what sorts of narratives you are interested in instilling in your outfits? Again, to go back to the idea of creating a character with dress, a collection, an outfit, whatever-it can tell a story. When I design a collection, a lot of research goes into it and so I try and tell the story, or my interpretation of what I have studied through silhouette, textile design, pattern or texture. In that same vein, you also seem to be fascinated with contradictions. We’ve seen you pair natural floral patterns with neons and synthetic fabrics; construct cropped, short sleeved vests out of thick wooly fabric; and unapologetically mix inspirations. What purpose do these battling elements serve in your designs? Life is more interesting when there is opposition, discussion and disparity. More is more and I think the nature and the artificial will always work for and against each other. I like to create with respect to both because they will forever work side by side. To me, there is a real beauty to both. While designing your own clothes, you also design many of the textile patterns used in them, a rare find in the fashion industry. Can you walk us through the creative process it takes for you to make a piece from sketch to sale? My design process is immersive and I like to be involved in all aspects. As discussed, my collections start from a personal point of interest or curiosity. In this, it is personal to me and I like to build the collection from the ground up. I am particular and I like things how I like them. Because of this, I find the easier and best solution is to design my own prints. It makes it so that my clothes will be exactly as I envision them. When I close my eyes and think of what I want to make, I usually see them in full colour, pattern, print, and texture. Because they are in my head, it’s likely the only answer to design them myself. It creates an exciting challenge. You’ve also drafted prints for other designers. How does this process differ from creating them for your own use? Design, most simply is art for a client or specific purpose. I have always been good at understanding or interpreting the ideas and needs of clients, colleagues and other designers. If I am working for someone, my end goal is to exceed their expectations and create work that maintains my artistic integrity, whilst simultaneously staying true to their aesthetic and creative vision. Despite having produced only four collections, there’s an observable growth. What is the most evident way in which you’ve seen the label’s growth and how do you expect it to grow in the future? Thank you. It can be difficult at times to be cognizant of this growth when you are going through the motions and it is your life. Upon reflection, however, I would say I have been able to better organize myself: my thoughts, my time, my ideas, my finances and have really just become a better sewer and pattern maker. Over the years I have challenged myself and kept setting higher standards and more challenging goals for myself. I have an idea that I want to do everything and so I take it upon myself to learn new skill, e.g. dyeing, embroidery, etc. I have learned to better focus my vision and exercise patience. MICHONS MARIGOT is in a stage of transformation at the moment. With a brief pause in seasonal collections, the label is in a process of organizing, planning and relocating. With all these changes, the hope is to stop, but establish something with real longevity and resonance. The Decoration collection was shot by Katrina Cervoni for MICHONS MARIGOT. Rachel Stanga is wearing the Uneven Split Jacket over the Best Pinny. All styling and art direction by Michons Marigot and makeup by Christine Jaramsingh. The Fragmented Flowers collection was shot by Katrina Cervoni for MICHONS MARIGOT. Khyra was styled by Michons Marigot with makeup by Christine Jaramsingh. All art direction by Michons Marigot.